Donald Knuth’s 24th annual Christmas lecture inspired me to implement algorithm X using dancing links myself. To demonstrate how this algorithms works, I choose the n-queens puzzle. This problem has some interesting aspects to it which show all kinds of facets of the algorithm. There can only be one queen in the given row. There can only be one queen in the given column. There can only be one queen in the diagonal going from top left to bottom right. There can only be one queen in the diagonal going from bottom left to top right. Assigning an identifier can be done straight forward: column based constraints are numbered 0-3; row based constraints get the ids from 4-7; diagonals 8-12; reverse diagonals 13-17 for a chessboard of size 4. Note that you can ignore the diagonal of size 1, as they are automatically covered by the row or column the queen would be placed in. Note that each constraint identifier calculation we use an offset, so we can all represent them in one context: 0 for the row constraints, N for the column constraints, 2N-1 for the diagonal and 4N-4 for the reverse diagonal constraints. For the diagonal constraints you need to ensure they are within their ranges: 2*N-1 < constraint < 3*N and 3*N+1 < constraint < 4*N + 1. If the calculated identifier of the constraints is not within the ranges, you can just drop the constraint – this is the case for queens being placed at corner positions. Placing a queen at coordinates (0,0) will result in 3 constraints: [0, 4, 15]. Placing a queen at coordinates (1,2) will results in 4 constraints: [1, 6, 10, 16]. Now that for each queen that can be placed we can calculate the uniquely identifiable constraints identifier, we can translate this problem into an exact cover problem. We are looking for a set of placed queens, for which all constraints can be satisfied. Let’s look at a matrix representation (for a chessboard of size 4, in which the rows are individual possible placements options of a queen, while the columns represent the constraints. The 1s indicate that it is a constraint that needs to be satisfied for the given placement. Note that the table columns have been grouped into two categories: primary and secondary constraints. This is also a lesser known aspect of the algorithms at hand – primary columns and their constraints must be covered exactly once, while the secondary columns must only be covered at most once. 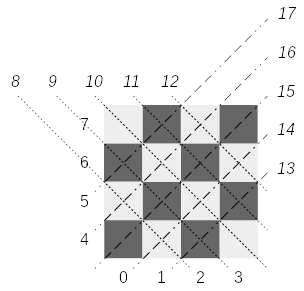 Looking at the n-queens puzzle, this make sense – to fill the chessboard to the maximum possible number of queens, each row and column should have a queen, while there might be diagonals which are not blocked by a queen. // these are must have constraints. // as these constraints do not need to be covered - do not weave them in. // find column with least items. // the actual backtrack search. // find the column matching the constraint. In future it would be nice how dancing links could be used to solve other e.g. graph search algorithms, such as A* or similar.better other ways to implement it.